Sun, Apr 14, 2019, 08:15 pm SL Time, ColomboPage News Desk, Sri Lanka. 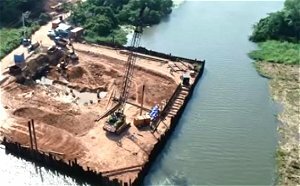 Apr 14, Colombo: A salinity barrier being constructed to prevent sea water intrusion into Nil Wala River during season under is expected to resolve the drinking water shortages in the district. D. I. Wijesiri, Project Director of the Matara Water Supply Project says it is the responsibility of a government to provide drinking water to the people without any shortages and fulfilling that responsibility, the government has been able to provide drinking water to over 2,298,200 people in the four years since 2015. In the first 4 years under the 7-year water supply program since 2015, clean drinking water has been provided to a total of 1,000 villages at a cost of Rs. 10 billion. Accordingly, in 2015 alone drinking water was provided to 1,090,333 persons under the "Gamata Wathura- Semata Sathuta" (water for village-happiness for everyone). Under the program, water supply projects will be carried out at a cost of Rs. 18 billion in the Matara district alone. The project implemented targeting the expected increase in population by the year 2046, will improve water supply to consumers of low water pressure areas. The project also includes network expansion and construction of a salinity barrier. In the fourth phase of the project 16,000 cubic meters of water obtained from the Nil Wala River can be purified daily to provide drinking water. Once the construction of the salinity barrier is completed, salt mixing into the Nil Wala River water will completely be prevented. Accordingly, solutions for the drinking water problem of the people in the Matara District will also be made easier, the Project Director said.